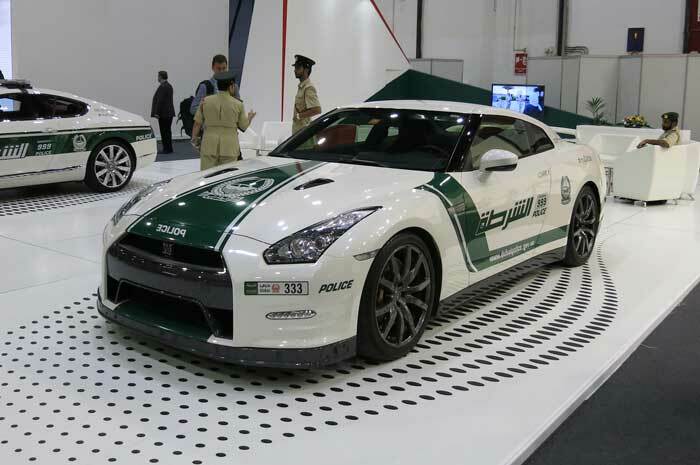 Dubai Police recently has made an addition of two new luxury cars to increase its supercars patrol fleet. The new luxury cars added to this list are Nissan GTR and Nissan patrol cars. This list of supercars already comprises of high performance super-cars including McLaren MP4-12C, Aston Martin One-77 and Bugatti Veyron. The inclusion of the new luxury cars is a step taken to enhance the performance of Dubai Police especially in the tourist areas. On Tuesday, new luxury cars which have been included in Dubai Police fleet were uncovered when Vice Chairman of the A.W. Rostamani Group and Khalid Abdul Wahed Al Rostamani, were received by Major General Khamis Mattar Al Mazeina, Dubai Police Chief. Talking to media, Major General, Khamis Mattar Al Mazeina stated that Dubai Police has always been concerned about the security of its residents and the addition in the Dubai Police Fleet with Luxury Cars is clearly linked to that. According to Dubai Police, these additional luxury cars will play a significant role in strengthening the patrolling of the specific areas toured mostly by the visitors. Major General, Khamis Mattar Al Mazeina added that “With the addition of the new luxury patrol cars, Dubai Police will have its presence improved all over the tourist areas of Dubai like Burj Khalifa and Shaikh Mohammad bin Rashid Boulevard”.